Riding horseback through a mystical forest is more like scene from a romance novel or a dream. Well The Real Deal Tours is here to make your dreams come true on one of our memorable horseback riding tours through the Monteverde cloud forest! Whether visiting a local Tico ranch or sauntering through the mystical cloud forest trails, Monteverde Horseback Riding tours has just the equestrian experience you have been dreaming about. Horseback riding is also considered one of the best eco tours in Costa Rica. Horses meander through the cloud forest with respect for the wildlife that shares their home. As you embark on our cloud forest horseback riding tours, you can feel good about leaving only hoof prints behind. Whether you're a newbie or an expert in horseback riding, we know you will enjoy the cloud forest horseback ride as our expert ranchers will match you up with the perfect horse for your riding experience. Our guide will assist beginners expertly and patiently, and those highly experienced ones can also feel the challenge that they've always been looking for. The best way to explore the Monteverde cloud forest and really take in all the surrounding nature is on horseback. So saddle up and choose your favorite cloud forest horseback riding tour in Monteverde today! Leave behind only hoof prints on this fun and relaxed horseback ride through the lush, picturesque and often mysterious Monteverde cloud forest region. This Monteverde cloud forest horseback ride lets you experience the uniquely green splendors of Costa Rica's cloud forest reserve, or the Bosque Nublado. 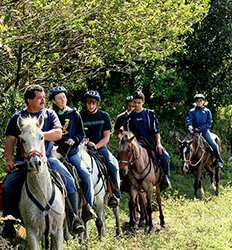 Monteverde Cloud Forest Horseback Ride deposit is $10.00 per Adult and $5.00 per Child.